Don't have a photo of your dog or don't want a tag with a photo? Our new no-photo tags are perfect. You get two Emotional Support Animal ID cards with your order, one for your companion and one for you to carry in your wallet so you can easily show others what the law says. These cards make it easy to educate the uninformed of your rights. 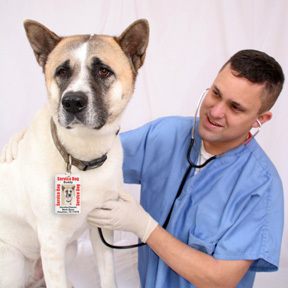 Your Emotional Support Animal ID Tags clearly identify your companion as a Emotional Support Animal. My order came in a timely fashion. I was able to secure the tag on my carrier with no problem. I did have a flight attendent question "emotional support"? Perhaps she needs to review her air line protocol. With any luck, I'll have the same flight attendent on my return flight and I can show it to her. Thank you for being available on line to purchase. Click the button below to add the No-Photo Emotional Support Animal Tag Set for Large Animals (2 Lrg Tags) to your wish list.